If you have child with special needs who will enter kindergarten in the fall of 2017 – NOW is the time to start the process. Do not wait until May or June of next year because you will be scrambling. The transition from CPSE to CSE is stressful. 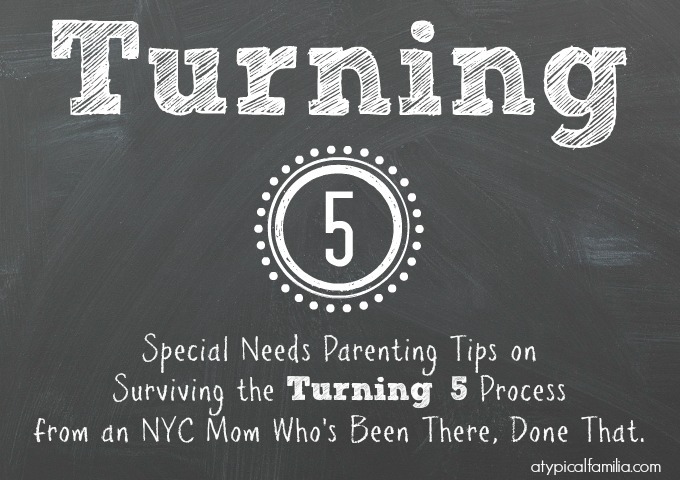 Turning 5 in New York City is a long, complicated process with a lot of red tape. So where do you start? Start with searching for appropriate placement and touring schools. What schools should I tour? ALL of them. Seriously. In New York City – there’s a lot of schools. Well, not a lot, but enough to keep you busy. Visit as many schools as you can. Public, private and even the ones you can’t afford. Do your research. Ask questions. Browse school websites. It is absolutely necessary to explore all options available. Where do I find special needs schools? There are a few ways to find schools that provide special needs services. Start with A Parent’s Guide to Special Education in New York City. This book will be your bible! Attend a special needs school fair. The JCC of Manhattan has one every year. At the fair, you may be able to schedule an appointment to tour, speak to school representatives and get applications. And it was a good way to weed out the schools I knew wouldn’t work for my son. But the best way to find out about schools is to talk to other parents who’ve been there, done that. If you’ve never been to a support group – now would be the time to go. For Bronx parents – check out the Bronx Parents Autism Network. Don’t be shy about asking parents where their children go to school. If you’re outside The Bronx and looking to connect with another special needs parent – visit parenttoparentnys.org. Visit your zone school, even if you know it’s not appropriate for your child – just go to say that you did. Visit the DOE website. Make an appointment to tour local District 75 schools. And check out other special education programs like the ASD Nest Program or ASD Horizon program. Visit our Autism Resources: Special Education Schools in NYC page for more information – HERE. Most school applications require a recent evaluation as well as past evaluations. Some applications will ask current teachers to fill out some sections. Applications can be 3 – 15 pages long. And most have a fee and a deadline of when to apply. Many schools will like the application before the Christmas break. Educate yourself! An informed parent is a powerful parent. The breakdown. Know your child’s legal rights. Tour schools. Gather paperwork. Apply. Wait. Cross your fingers, light a candle, say a prayer. And if your kid gets in, you’ll need to be prepared to prove to the Department of Education that it’s the most appropriate. Nice post. This is really a good effort by the Department Of Education which gives the liberty to teachers for sharing the best practices on problem solving in classrooms and integrating technology as a part of their curriculum. This should be encouraged in all schools.